Wonky Basket Blocks Tutorial | OccasionalPiece--Quilt! Posted on May 12, 2015 by Elizabeth E.
Carla, of Grace and Favour, asked us to make Wonky Baskets for her bee month for May 2015 Mid-Century Modern Bee. She sent us some photos of examples of Gwen Marston’s Liberated Baskets and gave us instructions to make colorful baskets with contrasting handles. I just found my way to completion. I thought I’d share how I proceeded. Carla’s request reminded me of a quilt I saw last summer in the Springville Art Museum, Going to Market, by PJ Medeiros (quilted by Amity Golding). 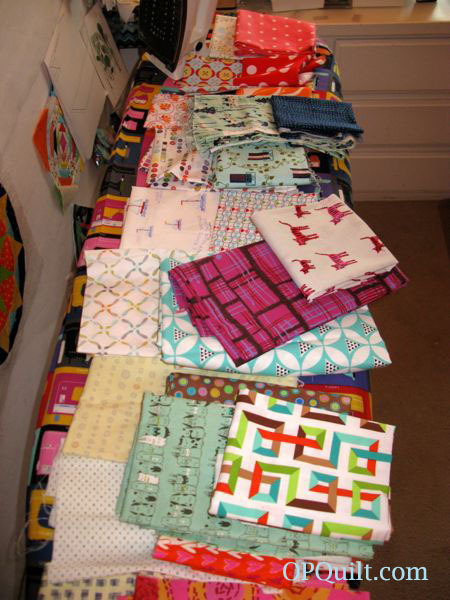 I then pulled up a bunch of two-fabric combinations and laid them all out on my ironing board, and started to cut. This is how I assemble the basket part, beginning with the bottom piece (or base piece). I lay the basket piece on top, about 2″ from the edge, and placing the ruler at a slant, I cut through both the LEFT base and the basket pieces. 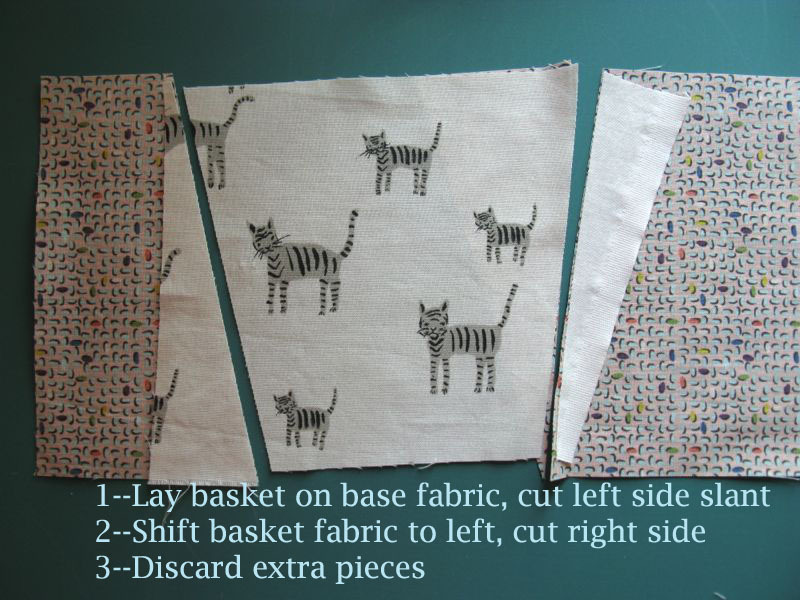 Shift the basket piece to the left so it overlaps the righthand base piece by about two inches, then lay your ruler down on a slant, and cut through both pieces. I show you how it looks once you are finished (above). Pin and stitch, then press towards the basket. Lay the upper piece and the newly constructed basket bottom piece together, then measure about 11″ from where you will cut the base; place a pin. This is the outer boundaries for the handle. 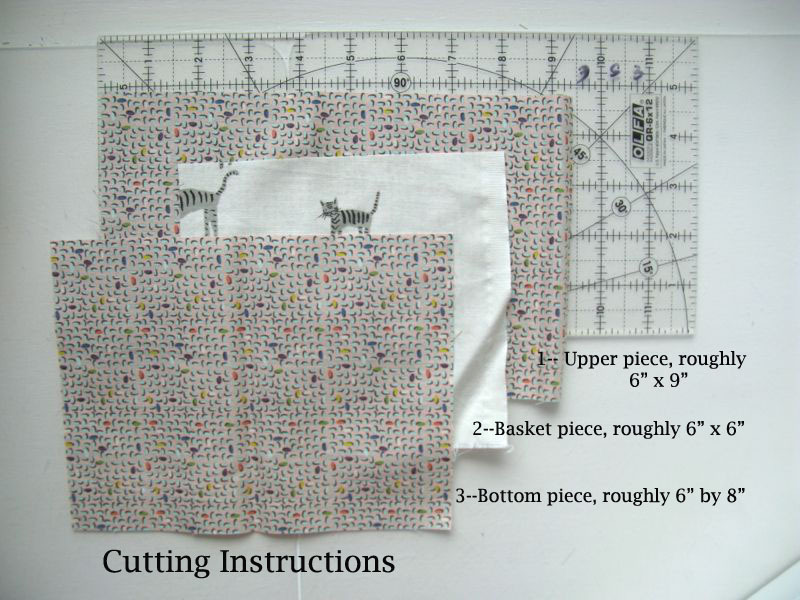 To make the handles, cut a bunch of bias strips anywhere from 1 -1/4″ to 1-1/2″ wide. 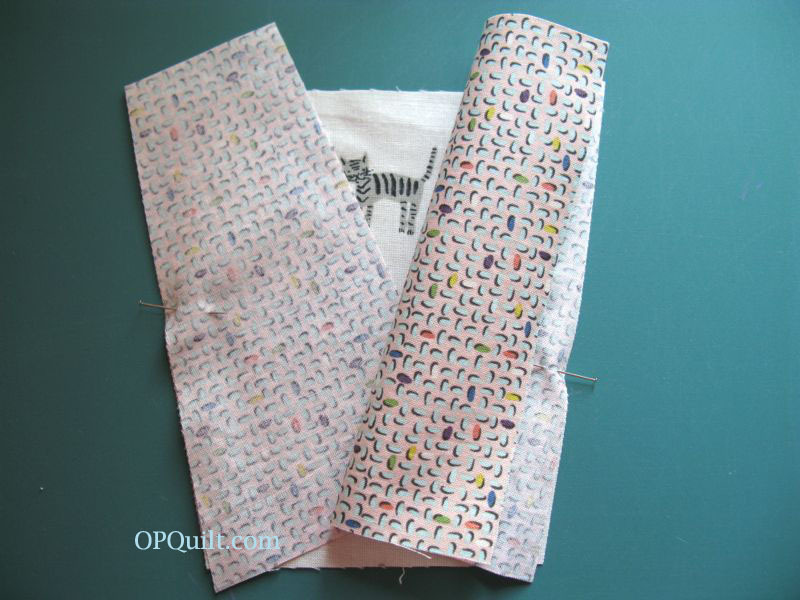 Fold in half, wrong sides together, long cut edges aligned and stitch a narrow (1/8″ seam). I have these bias strip press bars that help me with the next step: I slide them in, wiggle the seam to the middle back and press. You can just do this with your fingers on your ironing board. Try really hard not to stretch out your bias. 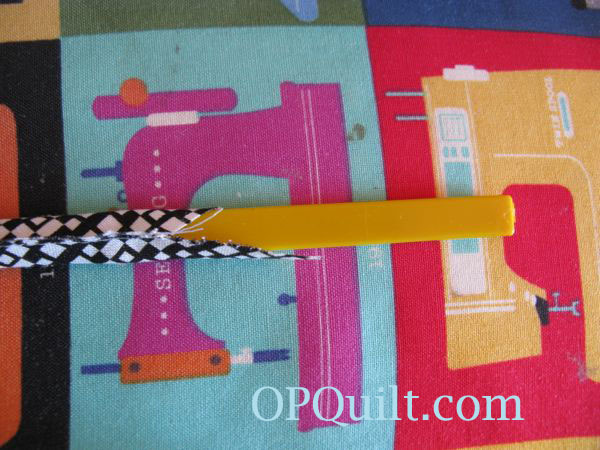 The above weensy picture (click to enlarge) shows me 1) auditioning bias strips for the handle (I have a bunch to choose from ). 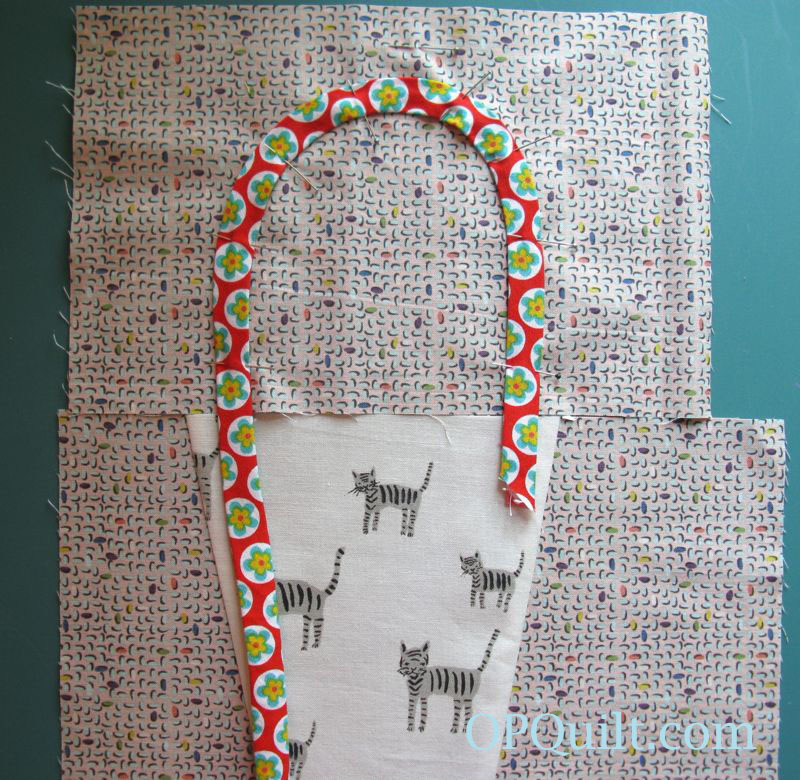 Go to the ironing board and press, with steam, a curve into your handle, then pin it on (photo below). It’s better to think about easing in the inside curve, rather than stretching the outside curve, but truthfully, both happen at the same time. Then back to the above photo: 2) stitch on the handle, doing the inside curve first, then the outside curve; 3) handle stitched, and finally 4) the seam between the upper and lower parts are stitched and trimmed. For the final press, press seam toward basket so the handle will look like it’s coming out of the basket. I cut and stacked a bunch so I could slide up here between grading and sew a couple. Bias strips are in the front. And now I have ten! You can see I’ve made one of them bigger. I also have a couple of midget baskets ready to make, too, to even out the rows. I’m just making them–I’ll figure out how to put them into a quilt later, after these last essays are graded, the final given and grades assigned. A perfect summer project, I think. Original pattern is by Laura Nownes. Your basket handles are so much easier than hers. I tried to make the quilt, but never finished it. I never could get the handles to work. 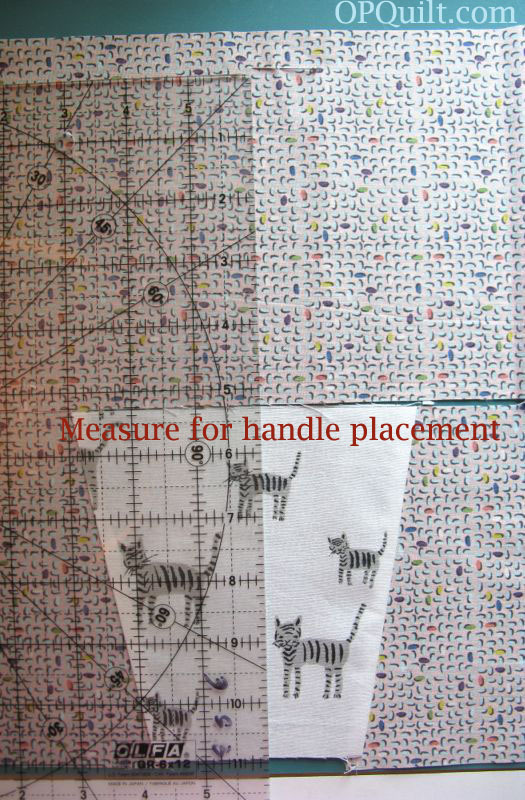 I will try your method using her pattern for the basic sizes. Thanks for even more detail on how to make these baskets! They are a fun block! I have one ‘reject’ that was a bit too small to send to Carla. I think it needs some friends! Love the baskets, Elizabeth. I may have to start some of my own with all of the fat 16ths and accumulated scraps I’ve gathered. Two things I really like about the museum quilt to think about. First, the variety in height of the baskets (and I’m sure you’re ahead of me on this one) is fun. I really like the wide, flat ones. The second thing that strikes me about that quilt is the use of the black stripe for handles. It looks so much like a rope handle, or a woven grass or reed handle (I’m thinking of one of the Carolina grass baskets I have). I’m really amazed. 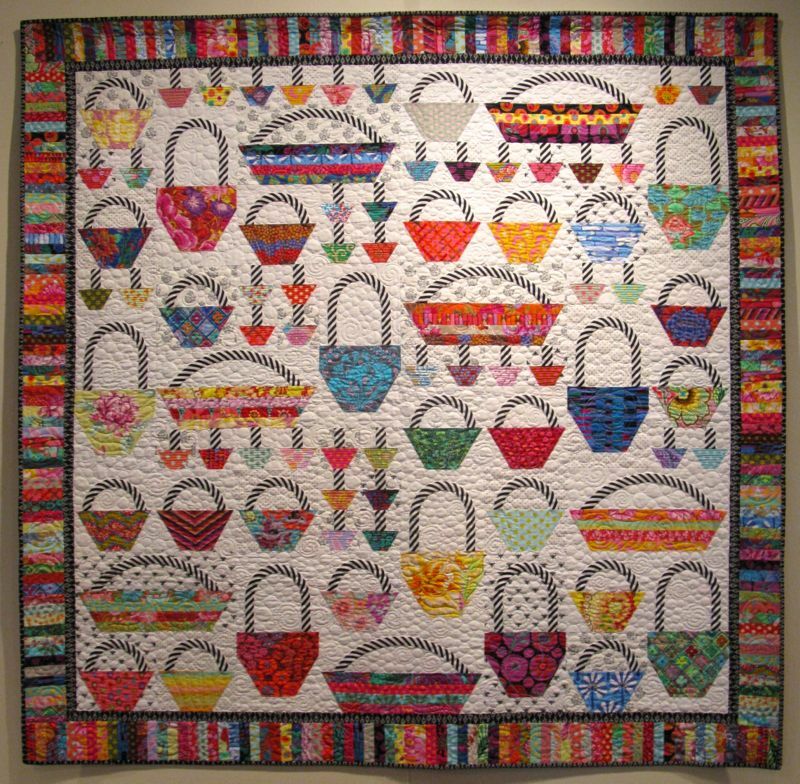 That is a pretty quilt for sure with all those baskets! 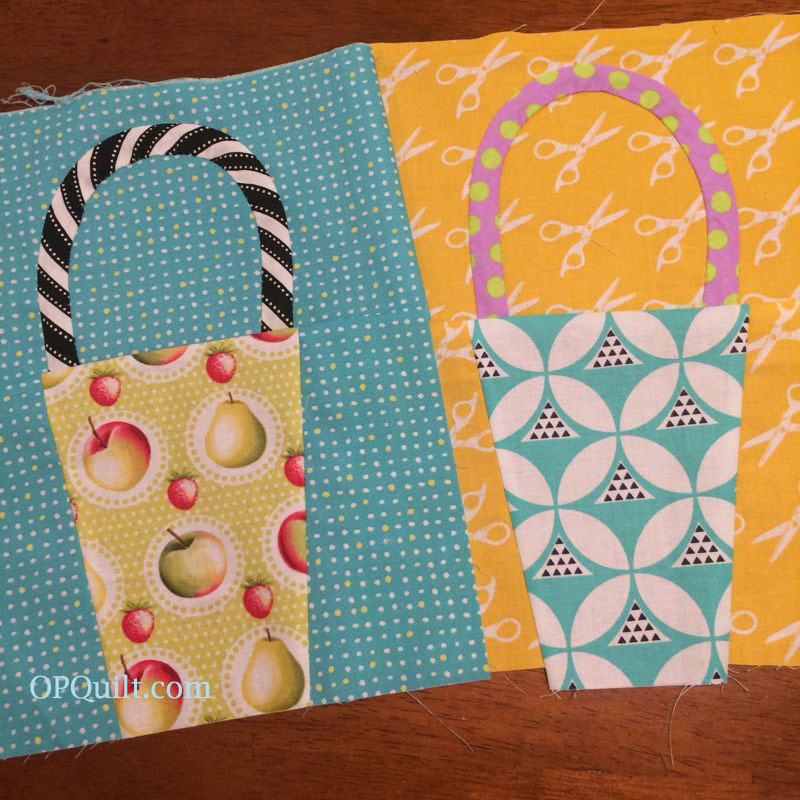 Thank you for sharing how to do a block and how to do those handles! Again, another great quilt. Thank you for sharing your process. It is enticing me to try it. Love what you’ve started! We did a BOM in our modern guild last year and baskets was one of ’em! I thoroughly enjoyed making mine and just posted on IG. They CAN be addictive (and yes, an easy escape from grading)! grading avoidance = lol would make a funny sub-titile to this quilt. 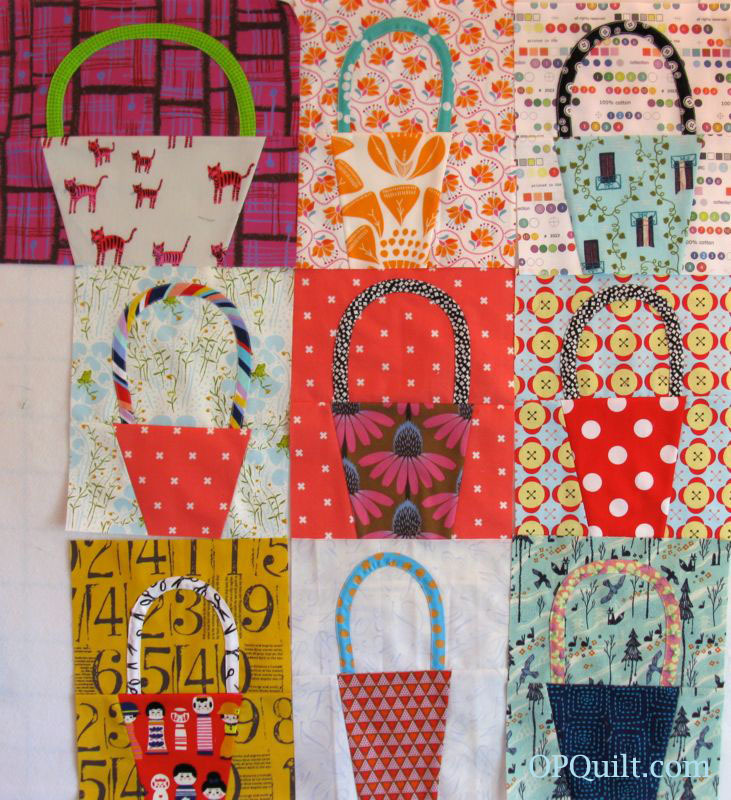 Love the basket blocks, how fun to make a whole quilt of them, thanks. I am hoping to make this quilt huge, but we will see. So many scraps to use up! Your baskets are gorgeous ! A much more productive method of grading avoidance than any I ever devised. Cute baskets. Avoiding the inevitable…….perfect!!!! LOL!!! Love the baskets!!!!! Will be watching……….. Thanks for sharing all the tips. Your baskets are lovely. Better get mine started. Pingback: Baskets Finished! | OccasionalPiece--Quilt! 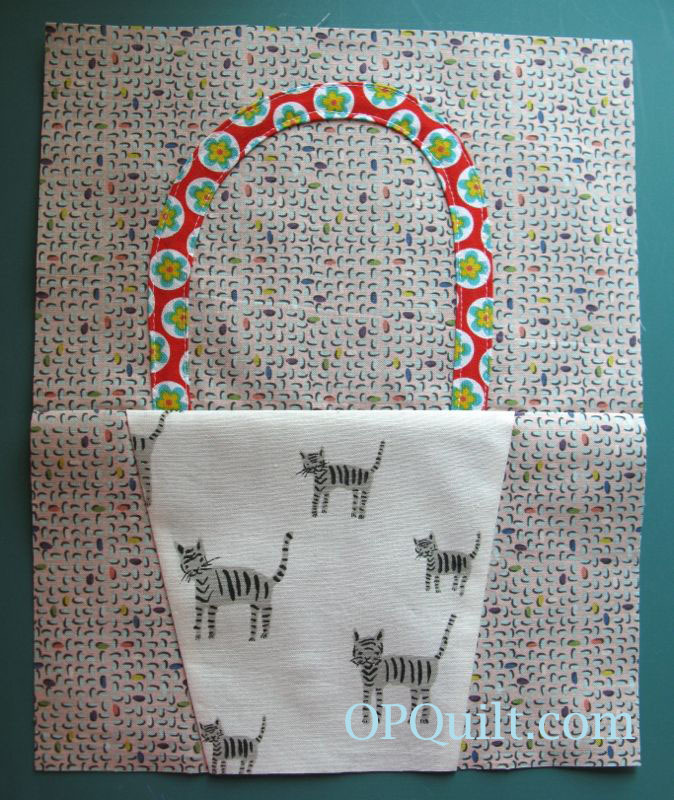 Pingback: Wonky Baby Baskets and Narrow Stem Applique | OccasionalPiece--Quilt! 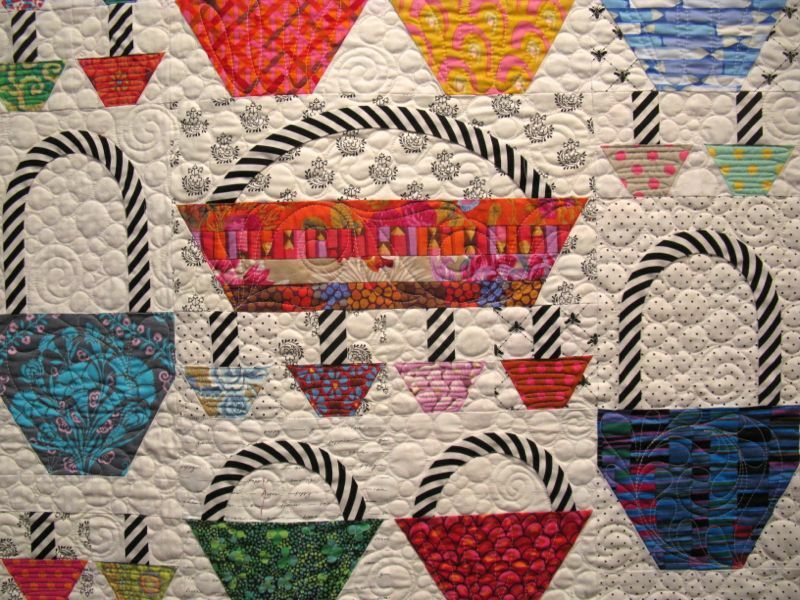 Pingback: Popsicles in My Way | OccasionalPiece--Quilt! 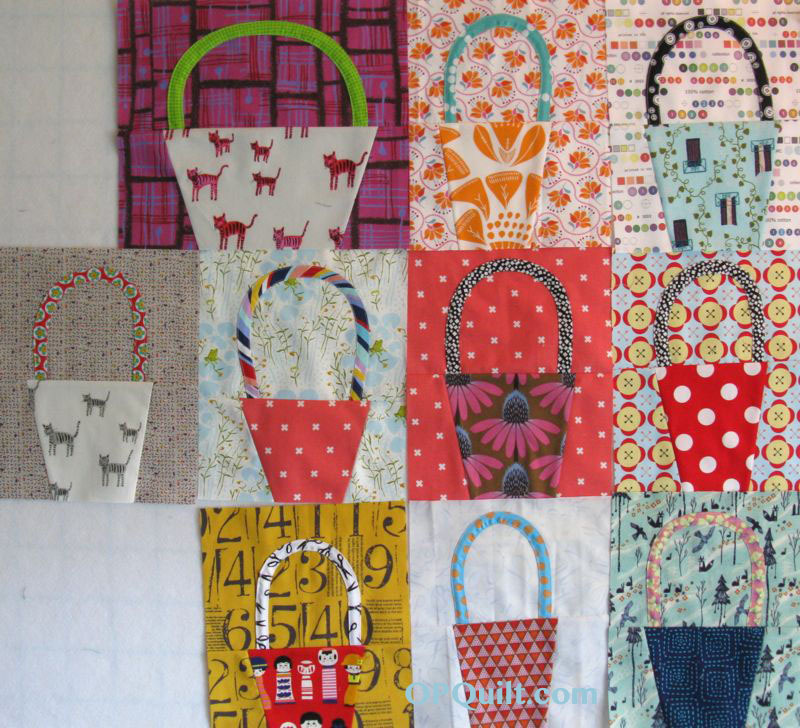 Pingback: Two Finishes: Baskets and a Halloween Quilt for 2016 | OccasionalPiece--Quilt! I love your Wonky Baskets. I took a class with Gwen Marston almost three years ago at our guild’s quilt show. She was our guest quilter who did classes. Of course, I took her wonky basket class. All the wonky baskets I have made were in the class. I think I completed – 2! She showed us a trick for basting the basket handle by machine and then taking it out. Naturally, I didn’t write it down. I need to ask one of the other guild members who took the class. I wish I had thought of your idea about a dose of fabric between papers. When I was in grad school, I taught jr/sr level ed classes online. I was working full-time and traveling for work, then just school and battling breast cancer, then working full-time, then I was just going to school and battling fibromyalgia. Finally, it was just too much. I quit 2 classes and my dissertation short of my PhD. I knew I was too sick to ever be able to get a prof job. I loved grad school – my doc was going to be in gifted ed. No, I didn’t teach except one semester at jr. college and while in grad school later in life. I was a computer programmer. I did have double majors (math and education) and double minors (Latin and computer science) in college. My masters is in education. I just didn’t know what to do when I grew up. I have a magazine one of the widowers at church gave me that has Gwen’s Wonky Basket in it. I wonder if it has her handle basting technique. I’ll have to see if I can find it in my many treasures. 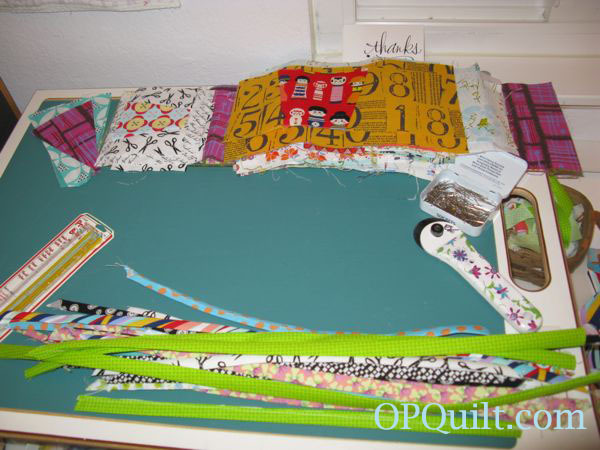 That’s for reminding I have 2 blocks toward some size of quilt. I adore it when people give tutorials – any especially when it is a great tutorial. Thanks.